The economy added 304,000 jobs in January, the Labor Department reported on Friday, well above the 165,000 economists had anticipated. 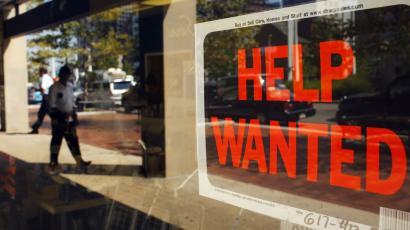 The unemployment rate ticked up to 4 percent from 3.9 percent, even as figures on labor participation remained steady. Temporary layoffs increased 175,000 as a result of the shutdown, the department said Friday, a figure that included some furloughed workers. All in all, the number of unemployed workers rose to 6.5 million in the survey. But the establishment side of the data seemed to shrug off the shutdown altogether. "There were no discernible impacts of the partial federal government shutdown on the estimates of employment, hours, and earnings from the establishment survey," the Labor Department said. Wages rose 3 cents, well below their 10 cent rise in December. All in all, average hourly earnings were up 85 cents in the past year, a 3.2 percent increase.